A transplanted Yankee in Brandywine Creek, GA, Piper Prescott has forged a new life after her divorce. She's running her store, Spice It Up, and dating a new boyfriend, veterinarian Doug Winters, whom she has persuaded to demonstrate how to make chicken curry at her shop. But before Doug can finish preparing the meal, local handyman Ned Feeney bursts in with shocking news: the strangled body of Sandy Granger had been found in the Brandywine Creek Opera House. While directing a local production of Steel Magnolias, Sally had managed to infuriate the entire cast and crew. Yet when Piper's best friend Ruby Mae Johnson becomes the prime suspect, Piper has to investigate to clear Ruby's name, much to the dismay of the dashing sheriff, Wyatt McBride. An intrepid amateur sleuth, Piper is determined to help her friends and family. 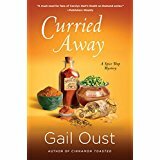 VERDICT Blending just the right ingredients of humor, mystery, and action, Oust bakes up a delightful and tasty Southern cozy in her fourth series outing (after Cinnamon Toasted). Paige Shelton and G.A. McKevett fans will eat this one up.